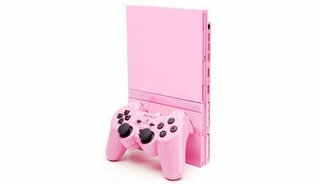 Looks like the UK is set to get this hideously pink PS2 which will retail for the same price as the other slim PS2s in that region. I'm guessing this is an attempt to reach out to the girl gamers who love them some pink. This is a cool idea and all, but I don't think they should stop with pink. Lets see some green and red and orange baby! I'd be all over those. Not really, but at least I would be able to post pictures of them for all of us to gawk at.